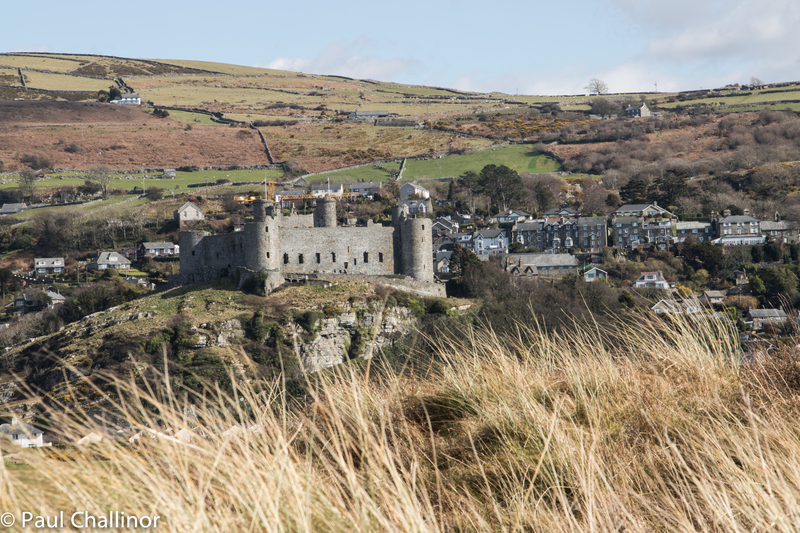 Castell Harlech: Welsh 100 – No 20. Harlech Castle. What can I say about it? This is a real and proper castle. One we all imaged a castle should be when we were kids – young or old. Sitting on top of the crag, it seems to grow out of the rock itself, with plunging cliffs on the seaward side, making it very difficult to approach except from landward. Now it broods over the old town of Harlech, with the small granite stone houses almost pushing the castle further towards the edge. Ironically, Harlech means ‘beautiful rock’. Unfortunately the weather today was very cold, dark and windy. Rain was never far away, so the photos don’t do Harlech justice. 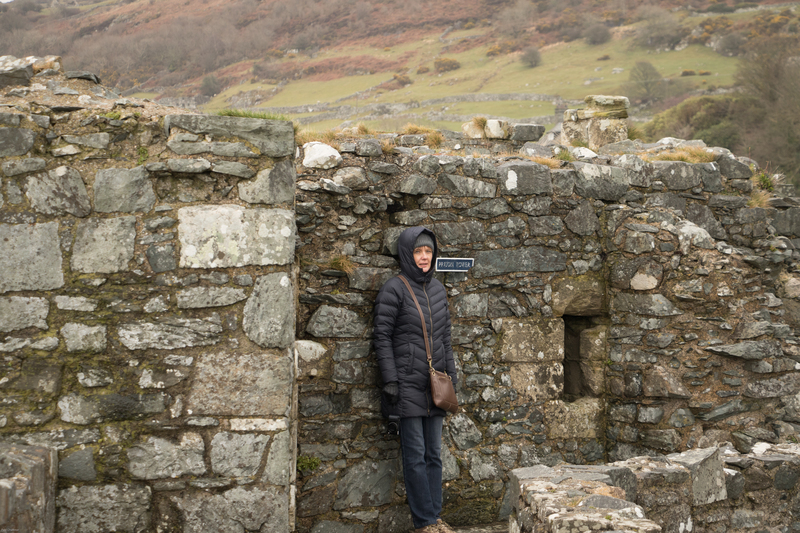 See if you can spot Aunty in some of the photos – dressed more like an Eskimo than an Easter tourist. We came back two days later when the sun was shining and it was 10C warmer. It’s not difficult to identify which day the photos were taken, but it does explain why some are grey, drab and depressing looking, while others have bright blue sky as the back drop. Even before the Castle was built by Edward I the area was associated with the legend of Branwen. I’ll cover this in the next blog posting. This is a great and fantastic story, full of Magic, love, betrayal and sacrifice. 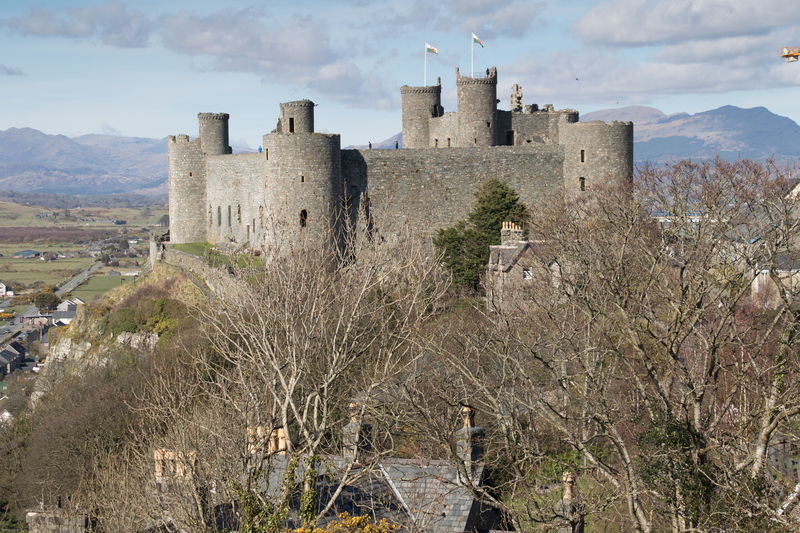 Harlech was begun during King Edward I’s second campaign in north Wales. It was part of an “iron ring” of castles surrounding the coastal fringes of Snowdonia, eventually stretching from Flint around to Aberystwyth; a ring intended to prevent the region from ever again becoming a focal point of insurrection and a last bastion of resistance. Following the fall of the Welsh stronghold of Castell y Bere, King Edward’s forces arrived at Harlech in April, 1283, and building work began almost immediately. Over the next six years an army of masons, quarriers, labourers and other craftsmen were busily engaged in construction. In 1286, with the work at its height, nearly 950 men were employed under the superintendence of Master James. The final result was a perfectly concentric castle, where one line of defences is enclosed by another. The final cost of just this one castle was £8,190. OK this may not sound much today, but in reality then it was a Hugh cost. It is impossible to accurately compare medieval and modern prices or incomes. For comparison, £8,190 is around twelve times the annual income of a typical baron of the period. The view form the top of the walls – it wasn’t really that cold! 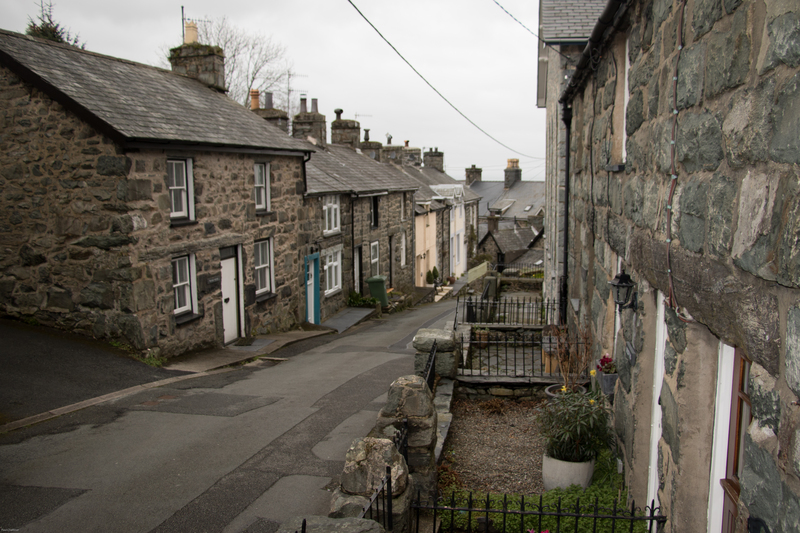 Harlech was established with a garrison of 36 men: a constable, 30 men, including 10 crossbowmen, a chaplain, a smith, carpenter and stonemason, and Master James was rewarded by being made the constable of Harlech from 1290–93. In 1294, Madog ap Llywelyn began an uprising against English rule that spread quickly through Wales. Madoc was rebelling against the subscription of the Welsh archers into the English army and the draconian control that the English were exerting over the conquered people. Several English-held towns were razed and Harlech, along with Criccieth Castle and Aberystwyth Castle, were besieged that winter. However, The garrison resisted the siege as fresh supplies were sent from Ireland by sea, arriving via Harlech’s water gate, and eventually the uprising was quashed. In the aftermath of the revolt, additional defences were built around the route down to the sea. Further work was undertaken between 1323–24, following the Despenser War; Edward II was threatened in the region by the Mortimer Marcher Lord family, and ordered his sheriff, Sir Gruffuld Llywd, to extend the defences leading up to the gatehouse with additional towers. This wasn’t the end of Harlech’s involvement in war. In 1400 a revolt broke out in North Wales against English rule, led by Owain Glyndŵr. The reasons for the revolt were many folded and I don’t have the space to go into it here. But Owain is still seen as a hero today but the Welsh. 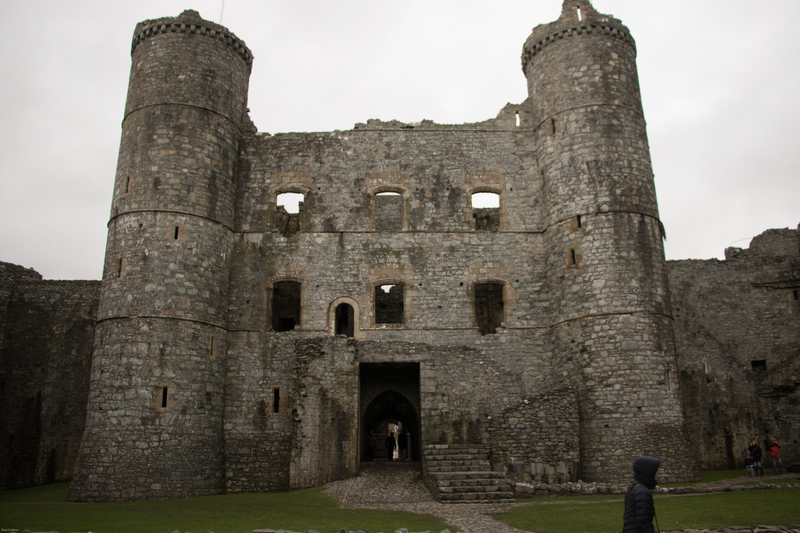 By 1403 only a handful of castles, including Harlech, still stood against the rebels, but the castle was under-equipped and under-staffed to withstand a siege, the garrison having just three shields, eight helmets, six lances, ten pairs of gloves, and four guns. At the end of 1404, the castle fell to Glyndŵr. Harlech became his residence, family home and military headquarters for four years; he held his second parliament in Harlech in August 1405. In 1408 English forces under the command of the future Henry V placed Harlech and its commander, Edmund Mortimer, under siege, conducting a bombardment with cannon, probably destroying the south and east parts of the outer walls. When this failed to take the castle, Henry left John Talbot in charge of the siege and moved on to deal with Aberystwyth Castle. Supplies finally ran short for the defenders, Mortimer and many of his men died of exhaustion, and Harlech fell in February 1409. The main entrance with it’s portcullis channels, gates and murder holes. It would be suicide to attack the gate house directly. 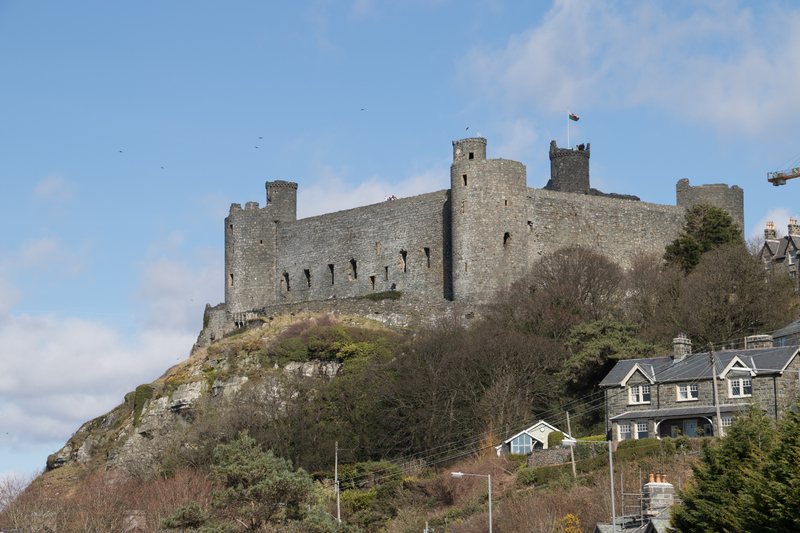 In the 15th century, Harlech was involved in the series of civil wars known as the Wars of the Roses that broke out between the rival factions of the House of Lancaster and York. In 1460, following the Battle of Northampton, Queen Margaret of Anjou fled to the castle and between 1461–68 it was held by her Lancastrian supporters, under the command of Dafydd ap Ieuan, against the Yorkist Edward IV. Thanks to its natural defences and the supply route by sea, Harlech held out and as other fortresses fell, eventually became the last major stronghold still under Lancasterian control. 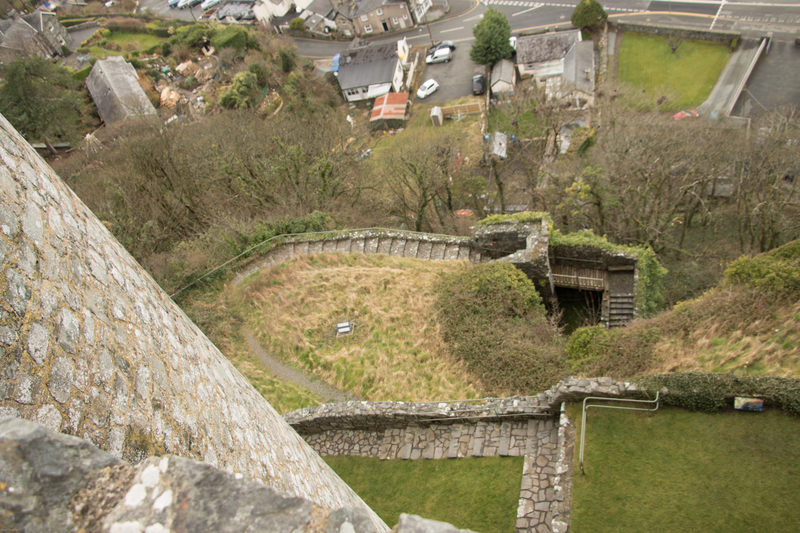 The castle became a base for their operations across the region: there were planned operations in 1464, Sir Richard Tunstall mounted attacks from Harlech in 1466 and Jasper Tudor landed there with French reinforcements in 1468, before then raiding the town of Denbigh. Tudors’ arrival caused Edward IV to order William Herbert to mobilise an army, possibly up to 10,000 strong, to finally seize the castle. After a month’s siege, the small garrison surrendered on 14 August. This siege is credited with inspiring the song Men of Harlech. looking up from the base of the rock. This used to be under the sea at the time the castle was built, but the shoreline has receded almost 3/4 or a mile way now. This still wasn’t the end of Harlech’s involvement with wider conflict and politics engulfing England and Wales. Yet again it was involved in conflict during the English Civil War. 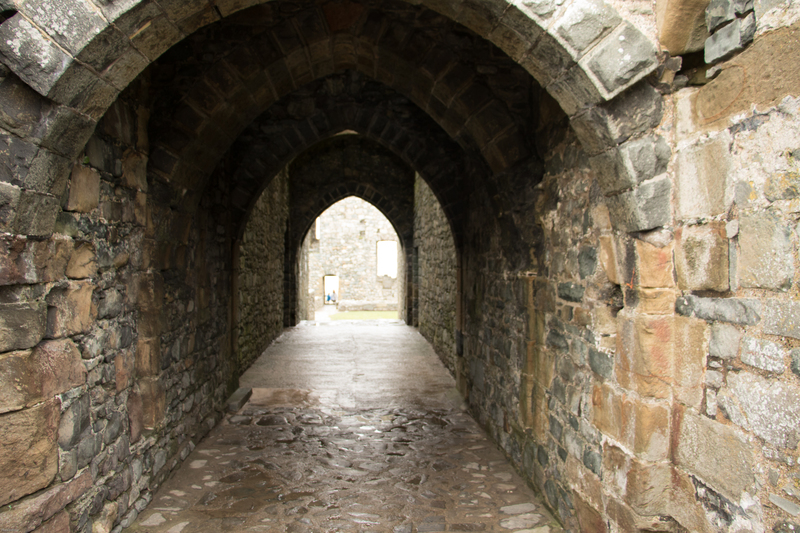 Harlech had not apparently been repaired following the 1468 siege, and had become completely dilapidated, with the exception of the gatehouse, which was used for the local assizes. In 1644 Prince Rupert appointed a local Royalist, Colonel William Owen, as the castle’s constable, and Owen was entrusted with repairing the fortifications. A long siege ensued from June 1646 until 15 March 1647, when the garrison of 44 men surrendered to Major-General Thomas Mytton. Ironically after hundreds of years of Welsh resistance and rebellion against English rule Harlech Castle was the last royal fortress to surrender in the war, and the date marked the end of the first phase of the war. The castle was no longer required for the security of North Wales and, to prevent any further use by the Royalists, Parliament ordered its slighting, or destruction. The orders were only partially carried out, however, and the gatehouse staircases were destroyed and the castle rendered generally unusable, but it was not totally demolished. Stone from the castle was reused to build houses in the local town. A small chapel graveyard perched on the cliff side, under the castle walls. 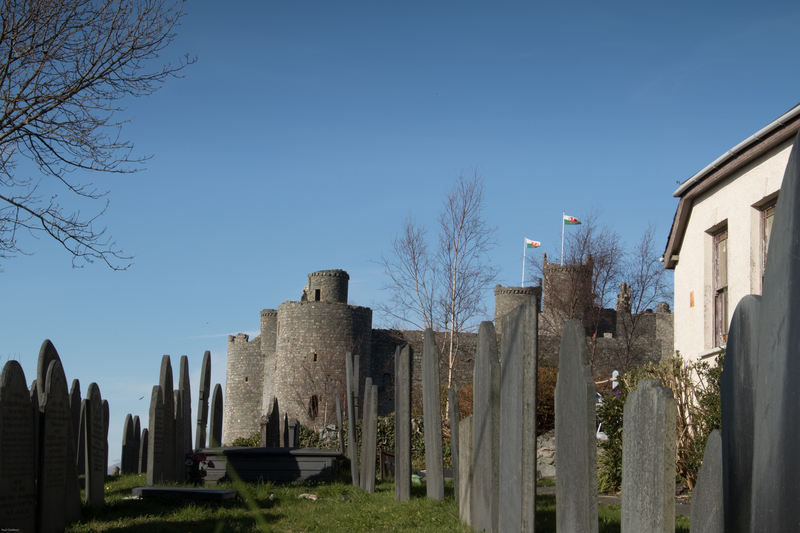 UNESCO considers Harlech to be one of “the finest examples of late 13th century and early 14th century military architecture in Europe”, and it is classed as a World Heritage site. There was a lot of work going on around the Castle with the installation of a new bridge direct into the Castle Gatehouse. This should make the approach much more exciting than the old access across the moat. Negotiating the narrow roads in North Wales is a challenge in itself towing a caravan, but my mind boggles at the thought of transporting the four huge lengths of the bridge along these roads. Then to top is all a 100 tonne crane had to be brought in to assemble another 200 tonne crane for lifting the bridge lengths into length one at a time. There’s a short video on how they did it here: http://cadw.wales.gov.uk/about/news/6m-project-bridges-the-gap-at-harlech-castle-for-the-first-time-in-600-years/?lang=en. Then because the sun was shining on the second visit we had to have a walk along the beach. This is glorious when the sun is out. 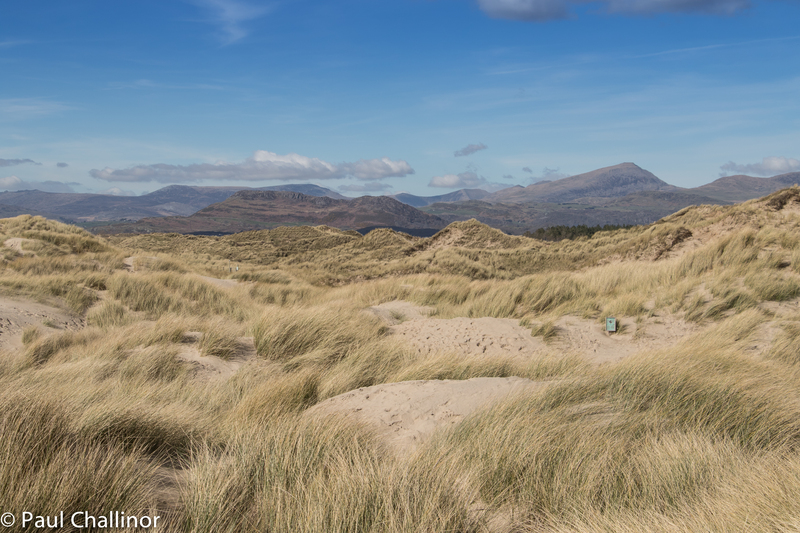 The sand dunes are majestic, and are now the site of a nature reserve. The beach stretches out ahead of you for miles whether you are looking north or south. The beach seems to stretch on for ever. The scale can be gauged by the tiny dots that are people in the distance. 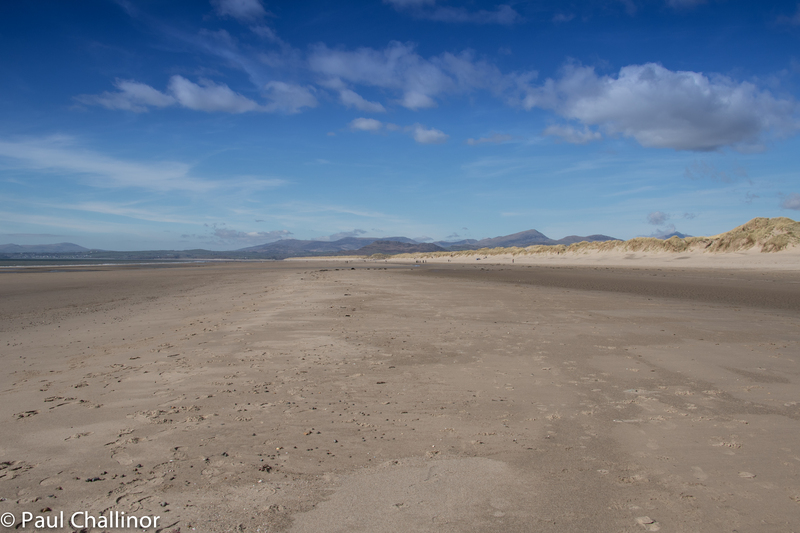 Could I have permission to use your photographs of the dunes and beach at Harlech for a poster for university? Thanks. Hi Jake. Sorry about the delay in replying to you. I thought I had already done so, but just noticed I had not done so. Of course you can use the photograph. Just let me know if there is anything else you need. Previous Previous post: The Albion – Welsh 100: No 19.